PITTSBURGH -- Ben Roethlisberger keeps trying to tamp down expectations, insisting the Pittsburgh Steelers remain a work in progress. The process nearly looks complete. If it's not, then things might really get out of hand. Looking in full command of an offense getting more dynamic by the week, Roethlisberger threw for 340 yards and six scores to set an NFL record for touchdown passes in consecutive games in a 43-23 victory over the Baltimore Ravens on Sunday night. "It's unbelievable," Pittsburgh defensive end Cameron Heyward said. "He's on a run right now." One that's unprecedented in league history. A week after passing for a franchise-record six touchdowns against Indianapolis, Roethlisberger duplicated the feat to lead Pittsburgh (6-3) to its third consecutive win. The 12 touchdown passes over the last two games broke the mark of 11 set by Tom Flores for Oakland in the AFL in 1963 and matched by New England's Tom Brady in 2007. "You could have never sold me that during the week, even though he did it last week," Ravens linebacker Terrell Suggs said. "But he had a helluva game, and that's a reflection on us all. You have stop him in some certain situations." The Ravens (5-4) didn't come close. Bolstered by a pregame pep talk from Hall of Fame defensive lineman Joe Greene, whose No. 75 was retired at halftime, and a throwback performance from 36-year-old linebacker James Harrison, the Steelers ended a pivotal three-game homestand with arguably their most complete victory of a suddenly promising season. Antonio Brown caught 10 passes for 138 yards and a score. Rookie Martavis Bryant hauled in two scoring receptions and has five touchdowns in three games after spending the first six weeks of the season on the inactive list. "Everybody has to wait for their opportunity," Bryant said. "It's just when the opportunity presents itself whether you take advantage of it or not." Joe Flacco passed for 303 yards with two touchdowns and an interception, but was sacked four times as the Ravens were undone by a sloppy second quarter. A fumble by Lorenzo Taliaferro and an ill-advised throw by Flacco helped start a 22-point Pittsburgh run to end the first half. "We set them up with two scoring situations," Baltimore coach John Harbaugh said. "When you put guys in that part of the field, they are going to have a chance to make some big plays." The renewal of one of the NFL's most physical rivalries traded its usual taut, low-scoring style for something decidedly more spectacular but no less physical. When Roethlisberger wasn't dissecting Baltimore's depleted secondary with his expanding number of targets, the teams were trading punches on a night the teams combined for 17 penalties, including a handful of personal fouls. "I think it was traditional Ravens-Steelers," Suggs said. "Sometimes, you just play football, but sometimes things get a little excessive." The Ravens, playing without injured cornerback Jimmy Smith, simply couldn't keep up. Even when things went wrong, they went right for Pittsburgh. The Steelers tacked on a 2-point conversion following Wheaton's score when punter Brad Wing made up for a botched hold by scrambling to his right and connecting with tight end Matt Spaeth to make it 22-10 at the break. Rather than sit on a 12-point lead in the fourth quarter, the Steelers kept attacking. Roethlisberger found Brown for a 54-yard catch-and-run early in the fourth quarter to make it 29-10. Jacoby Jones responded with a 108-yard kickoff return for a touchdown, but Roethlisberger then hit the 6-foot-4 Bryant for an 18-yard strike and capped another remarkable night with a lob to Spaeth with 1:51 remaining to set the record. "That was such a big play for him," Roethlisberger said. "He has been around a long time and puts a lot of dirty work in." There was plenty to go around as the Steelers avoided a season sweep. The Ravens drew three defensive flags on one play alone in the second quarter and the intensity only ratcheted up even when the score got out of hand. Suggs earned a 15-yard penalty for an ugly shot at Steelers running back LeGarrette Blount's knees. Teammate Elvis Dumervil picked up another penalty two plays later after smacking Bell. Roethlisberger took a shot to the jaw from linebacker Courtney Upshaw that left the quarterback comically stretching his face trying to check for damage. He could afford to smile after the Steelers bounced back from a rough start with sublime play from a quarterback at the very top of his game. "I don't think any of us are surprised by anything he does," Steelers coach Mike Tomlin said of Roethlisberger. "We have been looking at it for some time." If not quite like this. Steelers S Troy Polamalu left with a sprained left knee in the second quarter and did not return. ... Baltimore TE Owen Daniels had six receptions for 53 yards a week after having minor knee surgery. ... Pittsburgh plays at the New York Jets next week while the Ravens host Tennessee. 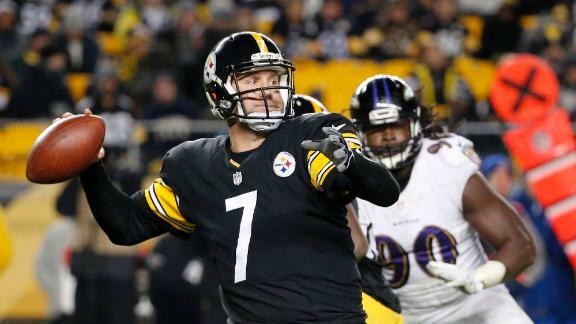 Ben Roethlisberger threw six touchdowns for the second straight game as the Steelers rolled over the Ravens 43-23. Dario Melendez and Eric Allen breakdown the Steelers win over the Ravens. Steelers reporter Scott Brown's game ball goes to James Harrison, who dominated the Ravens with two sacks and three quarterback pressures. Jacoby Jones gets the honor from Jamison Hensley after his 108-yard kickoff return in the fourth quarter.